Bit of an odd one, but some one might have come across this before. Is there a handy way of converting 3D effect B&W comic art to 2D? I did a quick test, the best way, I think is to take the 3d comic image into clip studio or photoshop, pump up the contrast a little bit and then convert the image to black and white - what you'll get is the blue will probably drop out and the right will then darken to black, this should leave you with the image you'd see in the red eye (which, iirc is your right). You'll have to play with contrasts to get exact results, and the bigger the image the better - you're basically looking to make one colour much darker than the other and then to make the lighter colour just vanish. Any overlap will be black (or at least dark) so you shouldn't lose anything important. Cam Kennedy did the first 3d episode of "Scorpio", he was the perfect for the job! 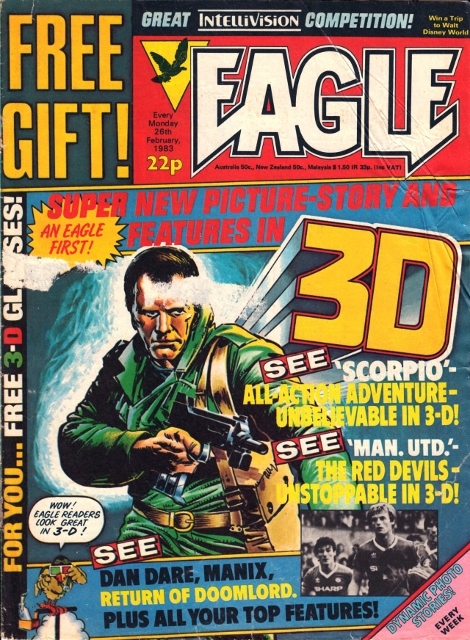 Did 2000ad ever have a 3d strip? Ha! Thats the one I was talking to PJ about. No, no 3D in 2000AD as far as I recall.